Trains stick to schedule. Buses can lag behind—but Orange Line buses rarely ever do. And Gold Line trains got tardier in the first month of the Foothill Extension. These are three takeaways from a KPCC analysis of Metro data, which counted 95.1 million bus and train trips from 2010 through March 2016. 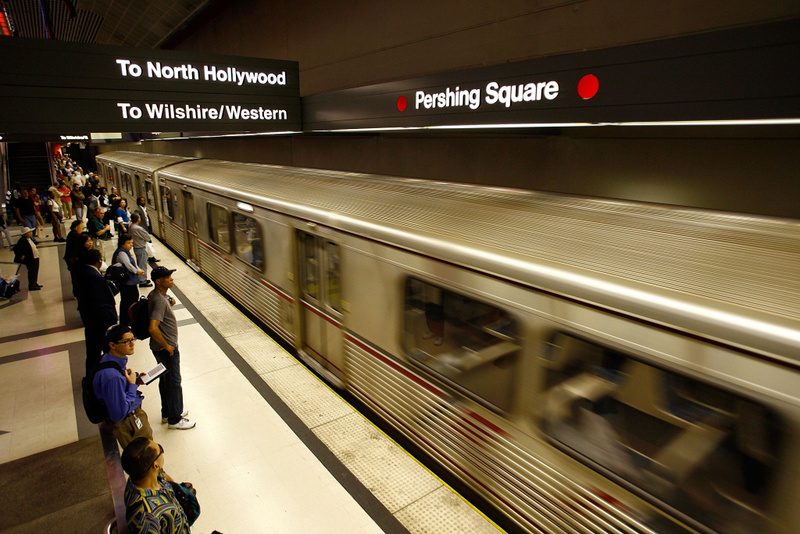 KPCC last checked in on the Metro's buses and trains in February 2015, 20 million trips ago. The latest data was provided by the transit agency in response to a records request. What does it show? Just 1 percent of train stops were late. That's 30,735 late stops out of 2,872,493 recorded by Metro since 2010. That number fluctuates from year to year. Barely half a percent of trains stopped late in 2010 and 2011. The number rose in recent years, landing at 1.2 percent late for 2015. This year, from January through March, trains have been late just under 1 percent of the time. Train trips are tracked by Metro staff, who enter information about late trains into a database anytime a train misses its stop by five minutes or more. The Red and Purple lines are consistently timelier than other Metro rail lines, and it's no coincidence they're the only underground lines in the system. "There are challenges between the different types of rail systems," said Metro's Tom Jasmin. "We have the subway system and the light rail system." Because they're fully underground, the Red and Purple lines don't contend with city streets and the traffic, intersections and pedestrians they bring. And they're heavy rail, as opposed to light rail. Their cars can each hold about 50 more passengers than a light rail car, Jasmin said. The agency tracks the two subway lines together. The Blue Line, the oldest in Metro's system, has been consistently the latest. Numerous street crossings along the route contribute to the Blue Line's late departures. In 2012, Blue Line trains were late 3.4 percent of the time. While that might be a headache for riders headed from Downtown L.A. to Long Beach, it still makes the Blue Line timelier than every one of Metro's bus routes. Jasmin noted that three of Metro's lines are aging, which can pose unexpected problems. The Blue, Red and Green lines each opened in the 1990s. Gold Line service was less punctual during its first month of an extension into the San Gabriel Valley, which opened on March 5. Trains were just 0.4 percent late in February 2016. That increased to 1.8 percent in March. Metro's Jasmin said that performance was hampered by a truck crash next to the tracks. The accident shut down service temporarily between the Allen and Arcadia stations, just a day after the Foothill Extension debuted with six new stations. The Gold Line's new stations were also serving more passengers. Metro estimates riders took nearly 1.5 million trips on the line in March, about 250,000 more than the previous month. Extending a train line is always a challenge, Jasmin added, with kinks to work out with new train cars. Issues with train cars or at-grade crossings could slow down early trips on the Expo Line extension, which opens May 20. Expo trains have been late just 0.4 percent of the time this year. Buses, on the other hand, had trouble making their stops on time in 2015. More than one-fifth of Metro's buses closed their doors behind schedule last year. 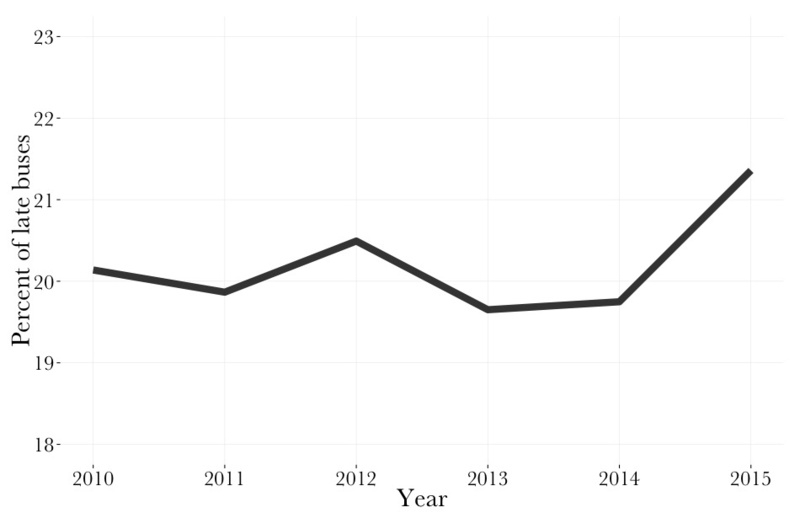 At 21.4 percent late, 2015 was the bus system's worst showing of the last six years. As with trains, only buses five minutes behind schedule are considered late. 2016 has been even worse for tardiness so far, with 22.7 percent of buses running late through March. What's behind the recent slowdown? Metro's Bob Holland said that recent construction has hurt buses' on-time performance. That includes Metro's own work on the Regional Connector downtown. Holland added that a number of other factors, including heavier traffic and road diets, have cut into on-time performance. "It's a struggle out there," he said. Transit officials said on-time performance matters, especially to bus riders. "If I'm waiting on a bus out there," Holland said, "I want that bus to be on time. Especially if I need to make a connection with another bus or train. I need to be on time." Even a small change in Metro's on-time performance means many more punctual trips. Metro tracked 16.1 million bus stops last year, and 3.4 million of them were late. A 1 percent improvement would have meant an extra 160,000 on-time boardings. Holland said Metro is trying to cut back on early trips to increase on-schedule ones. Over the last five years, about 1 in 20 buses have departed from stops early. Some bus routes do a much better job of sticking to their timetables than others. The Orange Line, alias line 901, arrives late at stops in its dedicated bus lane late just 5.4 percent of the time. Metro's Tom Jasmin called it "a rail line on rubber tires." On the other hand, a number of busy Metro bus lines miss their tables around 30 percent of the time. Several of those shuttle passengers between the Westside and Downtown. Below are the five Metro lines with the best and worst records of on-time performance since 2010. Each line has logged at least 250,000 stops. Is it possible to make buses as cool as the train?